The Return of The Undisputed Truth is a Sonic Blast From The Past - TheUrbanMusicScene.com | Music Reviews! In 1971, songwriter/producer Norman Whitfield had something to prove. After helming hits for established stars such as The Temptations, Marvin Gaye, Gladys Knight & The Pips and more, he challenged himself to create a group of his own vision to put across messages weighing on his spirit. The group he created was dubbed The Undisputed Truth – a male singer flanked by two female singers and backed by a psychedelic funk-rock orchestra bringing profound songs to radios around the globe, beginning with what would become their signature single on the Gordy/Motown label, “Smiling Faces (Sometimes)” (penned by Whitfield with partner Barrett Strong). Across the tumultuous musical landscape of the `70s, “The Truth” would undergo many mutations…moving from Motown to Norman’s own Whitfield Records (via Warner Bros.), shape shifting personnel that would feature players from Wah Wah Watson to singing siren Taka Boom (Chaka Khan’s sister) as the hits continued with “UFOs,” “You Make Your Own Heaven And Hell Right Here On Earth,” “You + Me = Love” and their own 10-minutes-plus “Ball of Confusion (That’s What the World is Today).” For Mr. Whitfield, Mission: Accomplished. But “The Truth” – like the beat – goes on. 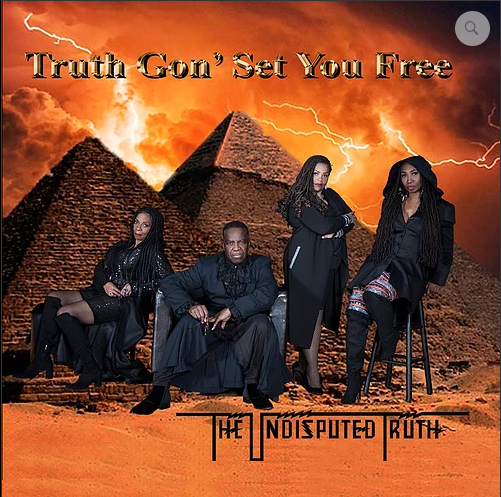 It’s been decades since The Undisputed Truth officially released new music…but they are back with a righteous vengeance on their powerful new 8-song CD, Truth Gon’ Set You Free. In 2019, The Undisputed Truth is original leader Joe Harris with original soul sister BJ Evans plus two new female singers: Dazee Love and Jaki G. Together, they have assembled a project that is eclectic, covers a lot of ground and is only in need of a few more contemporary touches. The album opens with the title track, “Truth Gon’ Set You Free,” a message about responsibility and humanitarian deeds over the paper chase set to a deep electric bass track with ghostly ghetto wisps of guitar and the trumpet of Dwight Adams crying the blues. Though well sung by Joe upfront, he falters with a short mid-song rap that does not extend the message of the song along and, so, is superfluous. Food for the mind continues with a song from the late Whitfield’s catalog entitled “You Can’t Run From Yourself,” a chillingly symphonic and southern spiced tune produced by Joe Harris, Rose Royce keyboard alumnus Michael Nash and engineer Rufus Harris in the vein of their old “Ma” and “Law of the Land.” Kicking a message about dealing with the man in the mirror, it is easily the album’s stone-cold classic that best illuminates the legacy of The Truth. Props to Torence Carey and the legendary Dennis Coffey for the searing guitars, Ralphe Armstrong on bass and T. Pablo on harmonica. This one is even reprised at CD’s end in an extended mix. What would a Truth LP be without one stretched-out cut? Dazee Love shines on the beautiful acoustic guitar and synth floated love song “Butterflies” – about someone richly inspirational in one’s life. This is followed by a raucous revisiting to Motown’s first big hit, “Money (That’s What I Want),” that sounds like a house party on wax with Marcus Elliot wailing away on tenor sax – a nod to The Truth’s uncut R&B roots. More problematic is a cover of “I Love You More Than You’ll Ever Know,” a song penned by Al Kooper who also sang it like a man sent into psychosis behind an unreciprocated love on horn rock legends Blood Sweat & Tears’ very first LP. It was followed by two powerful versions by the late, great Donny Hathaway – in the studio and live. Dazee softens the song for a female point of view in a jazzier lounge-like delivery that lacks dynamic punch. Perhaps this could be reworked as a duet between her and Joe – a direction yet to be attempted. This duo does a sweet job together with the new original romance message “What Good is Love,” peppered with more tasty horn from Adams. Jaki G brings the album to an inebriating finale with “Metamorphosis,” a song about returning love to the vibe of when it was new entitled “Metamorphosis.” This one will be a favorite of the sun roof open and drop top down folks this summer. Veteran Joe Harris is to be highly commended for helming the production on all of this CD’s selections with able assistance from various collaborators. With Truth Gon’ Set You Free, The Undisputed Truth is back, getting itself in perfect balance and on track to record many more needed statements on life and love for years to come. Can you dig it?